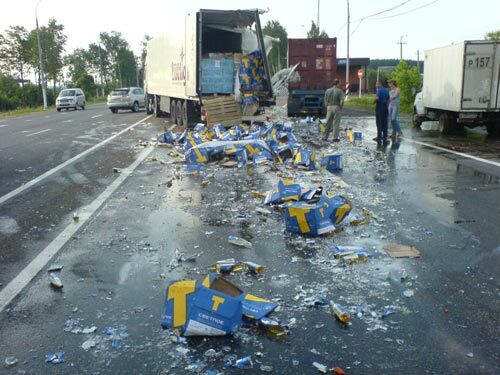 What happens when Russian roads meet a truck fully loaded with bottles of beer? 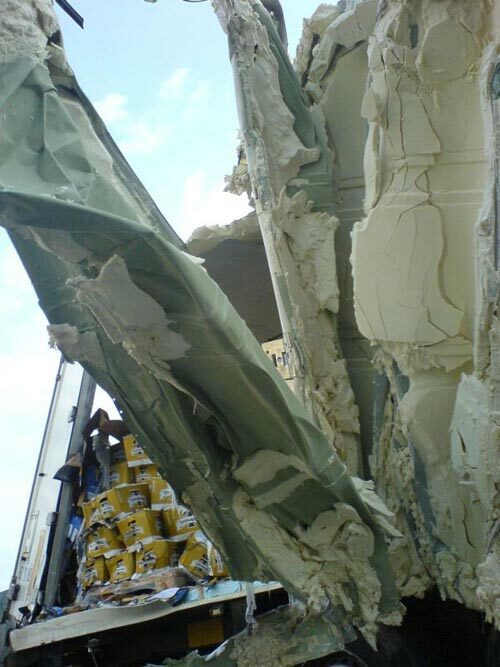 Probably the shipping company owner was trying to save a lot on the quality of his trucks, thus letting this happen. 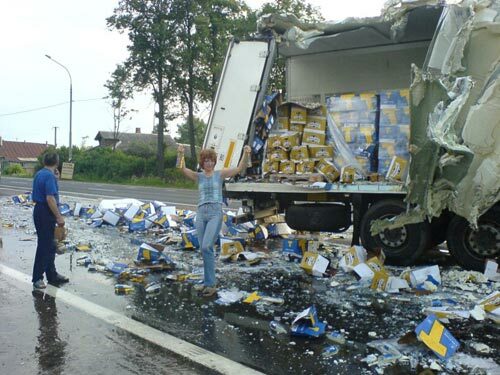 The truck simply broke apart while driving, letting all the bottles get out of it and fell over all the road. Oh no, these things happen all over the world. What a waste of very good drinkable beer. It makes a very sticky mess on the roads. 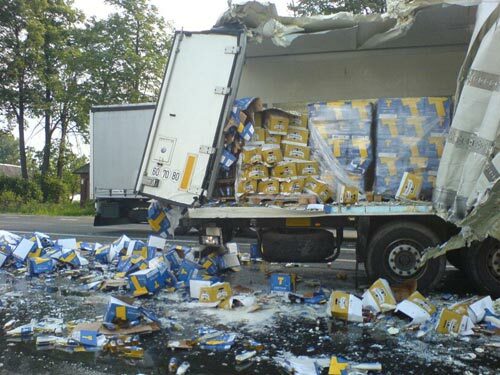 No the other truck just going a bit faster slightly caught the right side of the beer truck going slower peeling the side forward . Shifting loads do not peel the side of a truck like that. Probably he turned suddenly and cargo shifted to one side. Whoa, gentlemen. I’ve seen this kind of disaster also here in Finland. Why no the duty crying about BAD BAD BAD RUSSIAN ROADS here? I miss it yet. what brand of beer is that? is it any good? It’s “T” brand beer. Just a common light beer in fact. 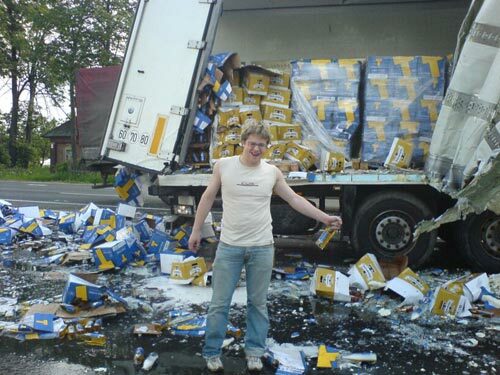 Alcohol Abuse! Save it quick! Probably due to bad roads. It is “T” – just regular cold-filtered beer -not good, not bad, and “Tinkoff” – really good beer. 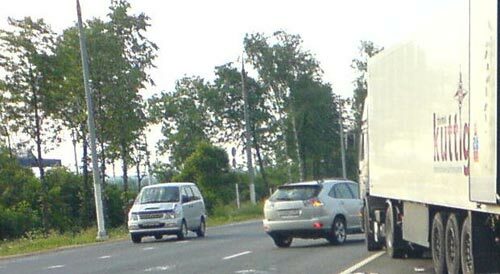 These pictures were first posted on the Russian website – http://www.fishki.net – about 2 months ago. The admin of this site just steals other people’s stuff without mentioning where he got it from. As for Tinkoff- I agree- this is the very good beer. For me- best beer in Russia. It happens near 30 meters from Road Police (DPS) control post. I think that Policemen was happy! Oh yes, that road is AWFUL !!! … WORST ROAD IN THE WORLD!!! Not. God, I’m so sick of this Russian bashing. I have a different interpretation of the accident. It looks like the red truck on the right hit the right back corner of the trailer and sheared it off. That’s why the right side is all crumpled forward. 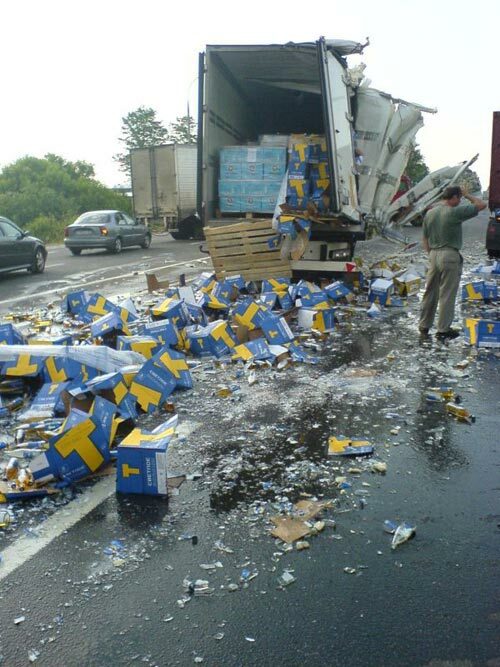 Then the cases spilled all over the road. nice info thanks for writing, hope you had a fantastic new year.